Talking about a mini-series is hard for me to do, because I can easily get carried away and spoil the story without realizing it. So this blog post is going to be short and simple. This is the final issue of Night of the Living Deadpool, and the ending is somewhere along the lines of what I was expecting. Hint: It’s Deadpool, so you know it’s something twisted, but comical. Previously, Deadpool was zombified for a brief moment or two. However that brief moment was enough time to wipe out the small, virus-free town he discovered earlier in the series. Before turning into a zombie, Deadpool discovered that Clarence, a former A.I.M. agent, was living in seclusion in that same town. The mad scientist revealed to Deadpool that A.I.M.’s experiments could have been the cause of the zombie virus outbreak. In the final issue of this dark and fun story, Deadpool, using Clarence’s head as a guide (remember the zombies talk until their brains rot away), finds his way to the laboratory in hopes of finding a cure for the zombie virus. Did he find a cure? You’ll find out when you read Night of the Living Deadpool #4. It is no surprise that Cullen Bunn is the writer of this warped tale. After following his Deadpool Kills, The Fearless Defenders, and Superior Carnage Annual, it was easy for me to recognize Bunn’s writing style from the beginning. Ramon Rosanas is the creative artist, and Jay Shaw provided the cover art. 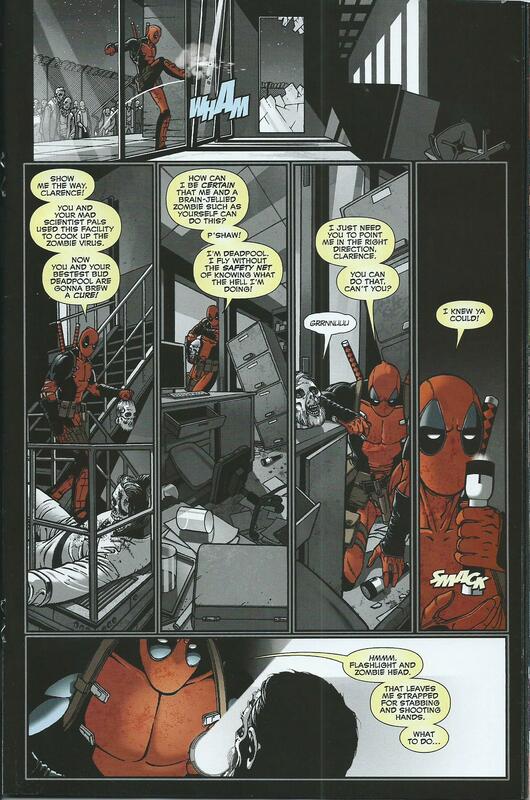 The black-and-white images, with only Deadpool in color, gives a dark and creepy feel throughout the series. 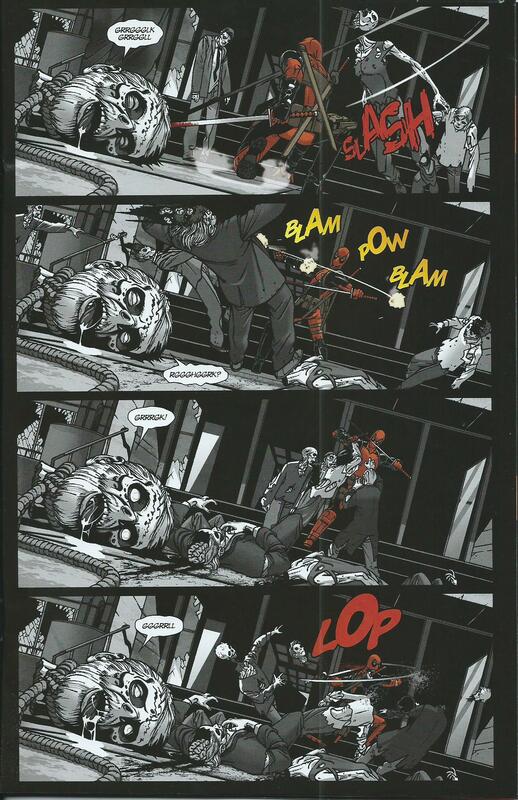 Thanks to Rosanas and VC’s Joe Sabino, Deadpool’s speech bubbles and sound effects are in color. Check out these two pages from the current issue. You can’t say that’s not awesome lettering. 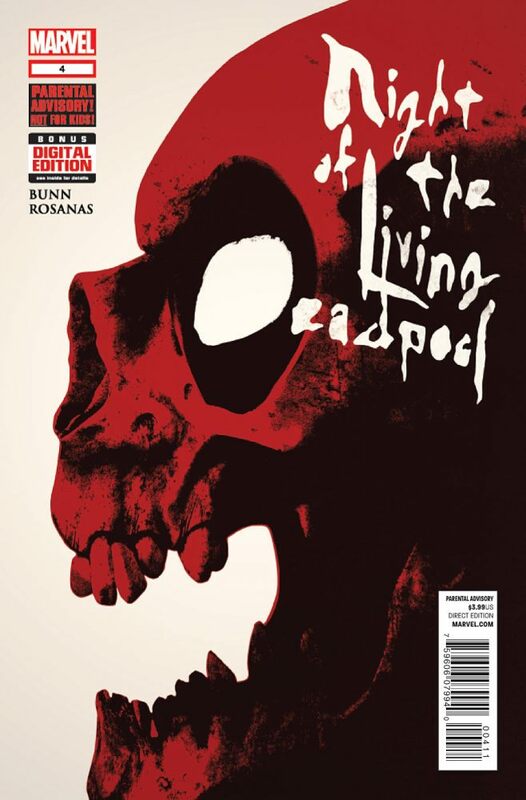 I enjoyed reading Night of the Living Deadpool. If you have not read this comic book yet, and you’re a Deadpool or zombie fan, then I suggest that you read this mini-series. It’s only four issues, and it’s full of action and laughs. This story gets 5/5 stars.